Other Names: Pittsburg Landing Location: Hardin County Campaign: Federal Penetration up the Cumberland and Tennessee Rivers (1862) Date(s): April 6-7, 1862 Principal Commanders: Maj. 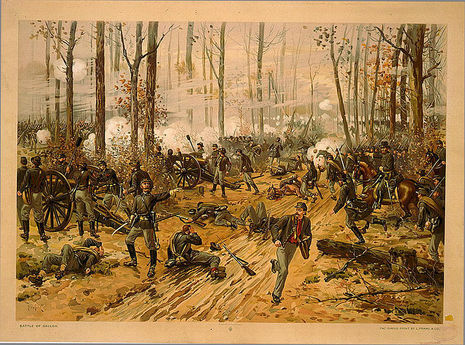 The Battle of Shiloh, also known as the Battle of Pittsburg Landing, was a major battle in the Western Theater of the American Civil War, fought on April 6 and April 7, 1862, in southwestern Tennessee. Confederate forces under Generals Albert Sidney Johnston and P.G.T. 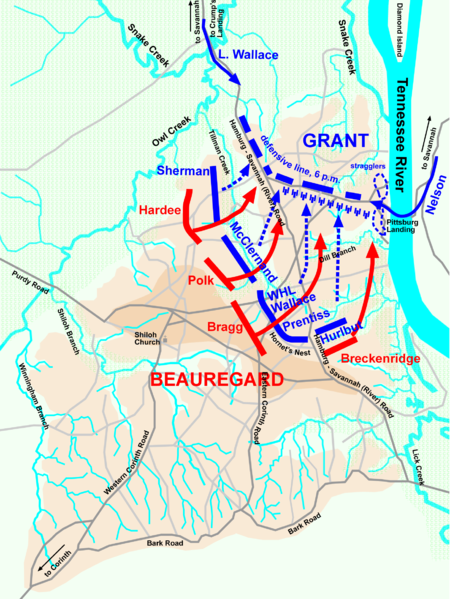 Beauregard launched a surprise attack against the Union Army of Maj. Gen. Ulysses S. Grant. The Confederates achieved some initial success on the first day but were ultimately defeated on the second day. On the first day of battle, the Confederates struck with the intention of driving the Union defenders away from the Tennessee River and into the swamps of Owl Creek to the west, hoping to defeat Grant's Army of the Tennessee before it could link up with Maj. Gen. Don Carlos Buell's Army of the Ohio. The Confederate battle lines became confused during the fierce fighting, and Grant's men instead fell back in the direction of Pittsburg Landing to the northeast. A position on a slightly sunken road, nicknamed the "Hornet's Nest", defended by the men of Brig. Gens. Benjamin M. Prentiss's and W.H.L. Wallace's divisions, provided critical time for the rest of the Union line to stabilize under the protection of numerous artillery batteries. Gen. Johnston was killed during the first day's fighting, and Beauregard, his second in command, decided against assaulting the final Union position that night. Reinforcements from Gen. Buell arrived in the evening and turned the tide the next morning, when he and Grant launched a counterattack along the entire line. The Confederates were forced to retreat from the bloodiest battle in United States history up to that time, ending their hopes that they could block the Union advance into northern Mississippi. 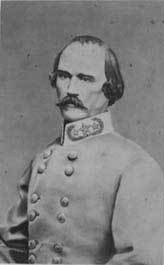 After the losses of Fort Henry and Fort Donelson in February 1862, Confederate General Albert Sidney Johnston withdrew his forces into western Tennessee, northern Mississippi, and Alabama to reorganize. In early March, Union Maj. Gen. Henry W. Halleck, commander of the Western Theater, responded by ordering Grant to advance his Army of West Tennessee (soon to be known by its more famous name, the Army of the Tennessee) on an invasion up the Tennessee River. (Because of professional and personal animosity toward Grant, Halleck initially designated Grant's subordinate, Maj. Gen. C.F. Smith, to lead the expedition, while Grant sat idly at Fort Henry. After President Abraham Lincoln intervened with Halleck and Smith was injured, Grant was restored to full command.) 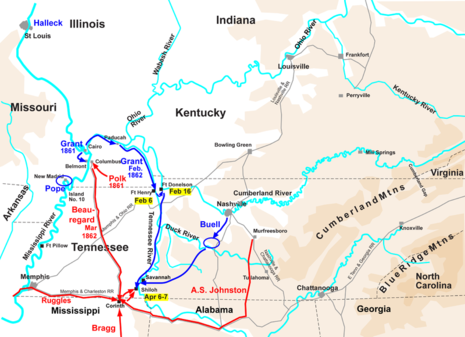 Grant's orders from Halleck were to link up with Buell's Army of the Ohio, marching from Nashville, and advance south in a joint offensive to seize the Memphis & Charleston Railroad, a vital supply line between the Mississippi River Valley, Memphis, and Richmond. Grant's army of 48,894 men consisted of six divisions, led by Maj. Gens. John A. McClernand and Lew Wallace, and Brig. Gens. W.H.L. Wallace, Stephen A. Hurlbut, William T. Sherman, and Benjamin M. Prentiss. Five of the divisions were encamped on the western edge of the Tennessee River. Grant developed a reputation during the war for being more concerned with his own plans than with those of the enemy. His encampment at Pittsburg Landing displayed his most consequential lack of such concern—his army was spread out in bivouac style, many around the small log church named Shiloh (the Hebrew word that means "place of peace"), spending time waiting for Buell with drills for his many raw troops, without entrenchments or other awareness of defensive measures. 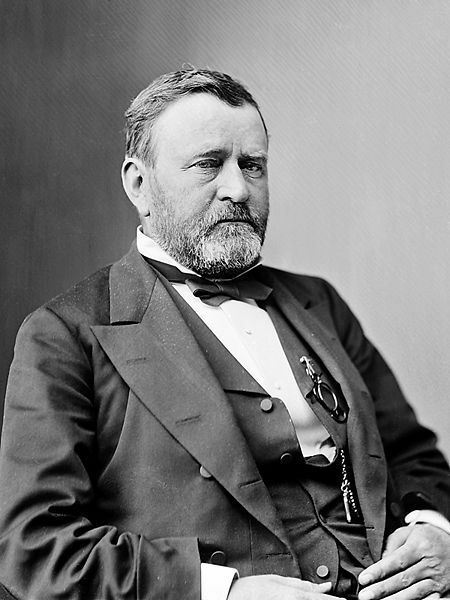 In his memoirs, Grant reacted to criticism of his lack of entrenchments: "Besides this, the troops with me, officers and men, needed discipline and drill more than they did experience with the pick, shovel and axe. ... under all these circumstances I concluded that drill and discipline were worth more to our men than fortifications." Lew Wallace's division was 5 miles (8 km) downstream (north) at Crump's Landing, a position intended to prevent the placement of Confederate river batteries and to strike out at the railroad line at Bethel Station. At 6:00 a.m. on April 6, Johnston's army was deployed for battle, straddling the Corinth Road. In fact, the army had spent the entire night bivouacking undetected in order of battle just two miles (3 km) away from the Union camps. Their approach and dawn assault achieved almost total strategic and tactical surprise. The Union army had virtually no patrols in place for early warning. 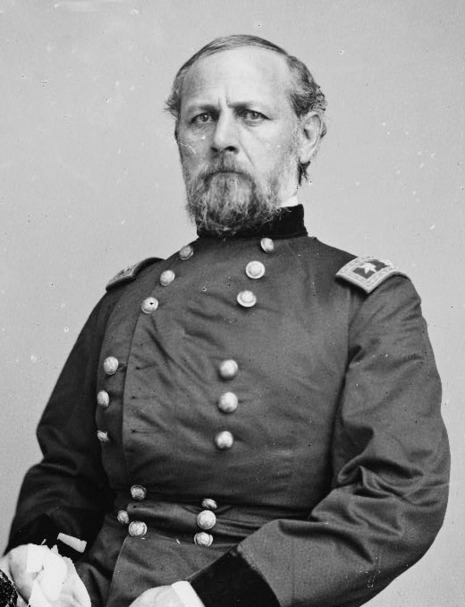 Grant telegraphed to Halleck on the night of April 5, "I have scarcely the faintest idea of an attack (general one) being made upon us, but will be prepared should such a thing take place." Grant's preparedness proved to be overstated. Sherman, Grant's senior commander in the encampment, did not believe that the Confederates were anywhere nearby; he discounted any possibility of an attack from the south, expecting that Johnston would eventually attack from the direction of Purdy, Tennessee, to the west. Early that morning Colonel Everett Peabody, commanding Prentiss's 1st Brigade, had sent forward part of the 25th Missouri Infantry on a reconnaissance, and they became engaged with Confederate outposts at 5:15 a.m. The spirited fight that ensued did help a little to get Union troops better positioned, but the command of the Union army did not prepare properly. 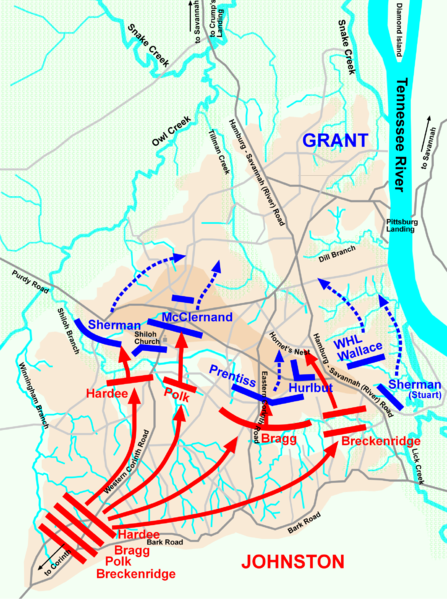 The assault, despite some shortcomings, was ferocious, and some of the numerous inexperienced Union soldiers of Grant's new army fled for safety to the Tennessee River. Others fought well but were forced to withdraw under strong pressure and attempted to form new defensive lines. Many regiments fragmented entirely; the companies and sections that remained on the field attached themselves to other commands. During this period, Sherman, who had been so negligent in preparation for the battle, became one of its most important elements. He appeared everywhere along his lines, inspiring his raw recruits to resist the initial assaults despite staggering losses on both sides. He received two minor wounds and had three horses shot out from under him. Historian James M. McPherson cites the battle as the turning point of Sherman's life, which helped to make him one of the North's premier generals. Sherman's division bore the brunt of the initial attack, and despite heavy fire on their position and their right flank crumbling, they fought on stubbornly. The Union troops slowly lost ground and fell back to a position behind Shiloh Church. McClernand's division temporarily stabilized the position. Overall, however, Johnston's forces made steady progress until noon, rolling up Union positions one by one. On the main Union defensive line, starting at about 9:00 a.m., men of Prentiss's and W.H.L. Wallace's divisions established and held a position nicknamed the Hornet's Nest, in a field along a road now popularly called the "Sunken Road," although there is little physical justification for that name. The Confederates assaulted the position for several hours rather than simply bypassing it, and they suffered heavy casualties during these assaults. The Union forces to the left and right of the Nest were forced back, and Prentiss's position became a salient in the line. Coordination among units in the Nest was poor, and units withdrew based solely on their individual commanders' decisions. This pressure increased with the mortal wounding of Wallace, who commanded the largest concentration of troops in the position. Regiments became disorganized and companies disintegrated. However, it was not until the attackers assembled over 50 cannon to blast the line that they were able to surround the position, and the Hornet's Nest fell after holding for seven hours. A large portion of the Union survivors were captured, but their sacrifice bought time for Grant to establish a final defense line near Pittsburg Landing. Part of the problem in dealing with the Hornet's Nest involved another setback for the South. Johnston was mortally wounded at about 2:30 p.m. while leading attacks on the Union left. Deeming a leg wound to be insignificant, he had sent his personal surgeon away to care for some wounded soldiers, and in the doctor's absence, he bled to death, his boot filling with blood. In fact the bullet damaged his popliteal artery. This was a significant loss for the Confederacy. Jefferson Davis considered Albert Sidney Johnston to be the most effective general they had. (This was two months before Robert E. Lee emerged as the pre-eminent Confederate general.) Johnston was the highest-ranking officer from either side to be killed in combat during the Civil War. Beauregard assumed command, but from his position in the rear he may have had only a vague idea of the disposition of forces at the front. He ordered Johnston's body shrouded for secrecy to avoid damaging morale in the army and then resumed attacks against the Hornet's Nest. This was likely a tactical error. The Union flanks were slowly pulling back to form a semicircular line around Pittsburg Landing, and if Beauregard had concentrated his forces against the flanks, he might have defeated the Union Army and then reduced the Hornet's Nest salient at his leisure. Beauregard sent a telegram to President Davis announcing "A COMPLETE VICTORY" and later admitted, "I thought I had General Grant just where I wanted him and could finish him up in the morning." Many of his men were jubilant, having overrun the Union camps and taken thousands of prisoners and tons of supplies. But Grant had reason to be optimistic, for Lew Wallace's division and 15,000 men of Don Carlos Buell's army began to arrive that evening, with Buell's men fully on the scene by 4 a.m., in time to turn the tide the next day. 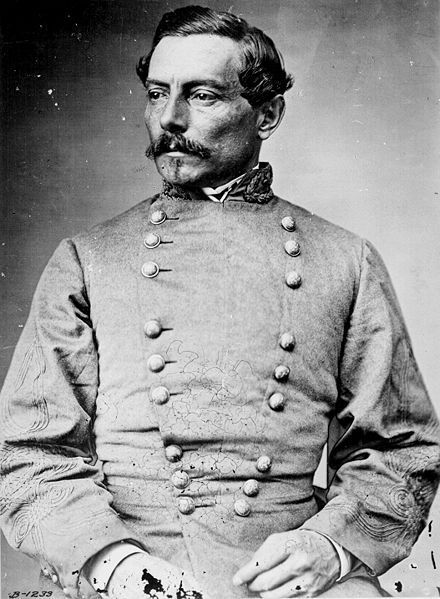 Beauregard caused considerable historical controversy with his decision to halt the assault at dusk. Braxton Bragg and Sidney Johnston's son, Col. William Preston Johnston, were among those who bemoaned the so-called "lost opportunity at Shiloh." 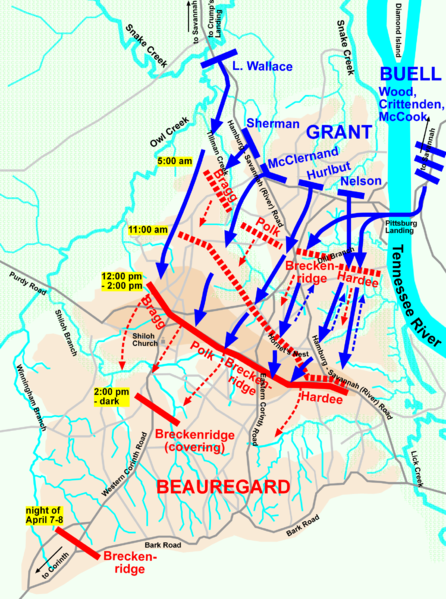 Beauregard did not come to the front to inspect the strength of the Union lines but remained at Shiloh Church. He also discounted intelligence reports from Col. Nathan Bedford Forrest (and bluster from prisoner of war Gen. Prentiss) that Buell's men were crossing the river to reinforce Grant. In defense of his decision, his troops were simply exhausted, there was less than an hour of daylight left, and Grant's artillery advantage was formidable. He had also received a dispatch from Brig. Gen. Benjamin Hardin Helm in northern Alabama, indicating that Buell was marching toward Decatur and not Pittsburg Landing. On April 7, the combined Union armies numbered 45,000 men. 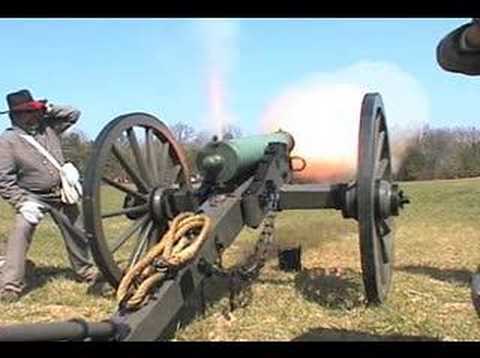 The Confederates had suffered as many as 8,500 casualties the first day. Because of straggling and desertion, their commanders reported no more than 20,000 effectives (Buell disputed that figure after the war, claiming that there were 28,000). The Southern soldiers had withdrawn south into Prentiss's and Sherman's former camps, and Polk's corps retired all the way to the April 5 Confederate bivouac, 4 miles (6.5 km) southwest of Pittsburg Landing. No line of battle was formed, and few if any commands were resupplied with ammunition. The soldiers were consumed by the need to locate food, water, and shelter for a much-needed night's rest. Nevertheless, Grant's career suffered temporarily in the aftermath of Shiloh. Henry W. Halleck combined and reorganized his armies, relegating Grant to the powerless position of second-in-command. In late April and May the Union armies, under Halleck's personal command, advanced slowly toward Corinth and captured it, while an amphibious force on the Mississippi River destroyed the Confederate River Defense Fleet and captured Memphis. Halleck was promoted to be general in chief of all the Union armies, and with his departure for the East, Grant was restored to command. Grant pushed on down the Mississippi to besiege Vicksburg. After the surrender of Vicksburg and the fall of Port Hudson in the summer of 1863, the Mississippi River was under Union control and the Confederacy was cut in two. Command of the Army of Mississippi fell to Braxton Bragg, who was promoted to full general on April 6. In the fall of 1862, he led it on an unsuccessful invasion of Kentucky, culminating in his retreat from the Battle of Perryville. The two-day battle of Shiloh, the costliest in U.S. history up to that time, resulted in the defeat of the Confederate army and frustration of Johnston's plans to prevent the joining of the two Union armies in Tennessee. Union casualties were 13,047 (1,754 killed, 8,408 wounded, and 2,885 missing); Grant's army bore the brunt of the fighting over the two days, with casualties of 1,513 killed, 6,601 wounded, and 2,830 missing or captured. Confederate casualties were 10,699 (1,728 killed, 8,012 wounded, and 959 missing or captured). This total of 23,746 men (counting both sides) represented more than the American battle-related casualties of the American Revolutionary War, the War of 1812, and the Mexican-American War combined. The dead included the Confederate army's commander, Albert Sidney Johnston; the highest ranking Union general killed was W.H.L. Wallace. Both sides were shocked at the carnage. None suspected that three more years of such bloodshed remained in the war and that eight larger and bloodier battles were yet to come. Grant came to realize that his prediction of one great battle bringing the war to a close was probably not destined to happen. The war would continue, at great cost in casualties and resources, until the Confederacy succumbed or the Union was divided. Grant also learned a valuable personal lesson on preparedness that (mostly) served him well for the rest of the war.